The Double Negative Collective presents a selection of recent experimental films and videos by Montreal filmmakers at Cinéma Parallèle. 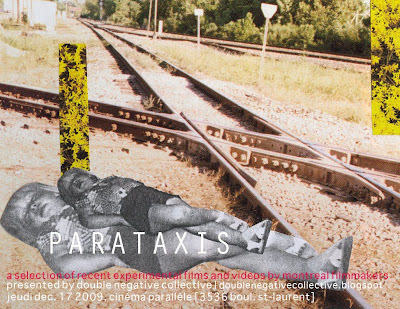 Parataxis is the juxtaposition of dissimilar images or fragments in language, creating new meaning with the odd pairing. In cinema, filmmakers usher in many surprising marriages of visual and sonic ideas with each depression of the splicer, as many curators articulate new meanings in a varied program of film and video work. With this program, the Double Negative Collective presents a selection of recent experimental films and videos by Montreal filmmakers at Cinéma Parallèle.